Offering distinctive analog delay sound with roundish but forceful tone. Creates a natural reverb effect which does not interfere with original sound. Maximum delay time of 600 ms. is available in spite of the compact enclosure. Low-noise design with no distortion. Creates clear and brilliant delay sound for every note, which is also available when combined with overdrive or distortion pedal. 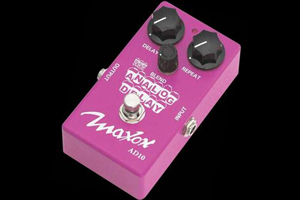 True analog delay with BBD ICs. Distinctive analog aggressive feedback playing is possible. LEDs to indicate bypass/effect and battery condition for trouble-free performance. Dimensions: 2.76" x 4.45" x 2.20"